The NSEC SoS Advanced Study Institute is looking for post-doc and advanced doctoral students for their 3 week program. We are currently soliciting applicants for the Advanced Studies Institute. 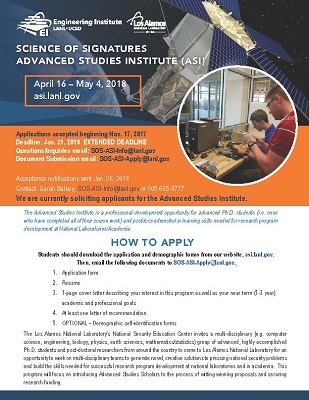 Students should download the application and demographic forms from our website, asi.lanl.gov. Then, email the following documents to SOS-ASI-Apply@lanl.gov. with team presentations on their solution concept to a committee of LANL staff and program managers for critical review. will have the opportunity to shape new fields.